Co-Existing with Coyotes » Wild Coyotes. Safe Pets. 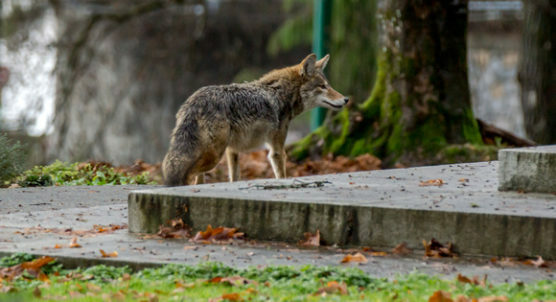 Coyotes living across Vancouver will be giving birth to a new litter of pups this spring. 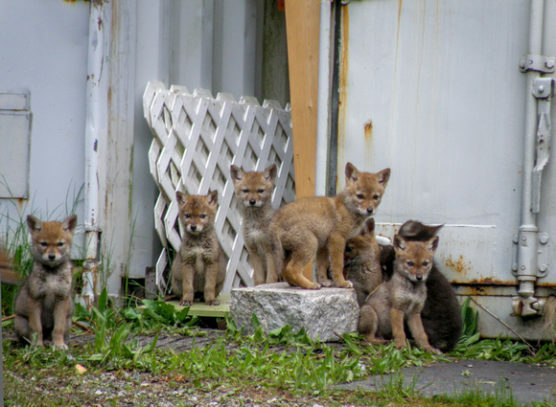 To prepare for their young right now, coyotes are choosing a location to dig their den. Good den locations are well hidden in secluded areas. In cities, preferred sites include natural areas of parks and ravines, around golf courses and cemeteries, and even under vacant buildings or porches. Make sure to report your coyote sightings to SPES’ Co-Existing with Coyotes program online or at 604-681-WILD. Hart explains that, “Coyotes are normally timid and shy animals. We can do our part to keep them wild by scaring coyotes away and removing food sources around our homes.” Reducing food sources—like loose garbage, open compost, wild fruits, pet food and bird seed—will help the new coyote pups learn to hunt their natural foods: rodents such as rats and mice. These simple actions help keep people, pets and coyotes safe. Together, we can coexist with these often misunderstood urban animals.